by Becky Barbour, Columbus, Ohio, writer and book reviewer. This review appeared in the Book Club section of go-mom.com. TELL US A LITTLE ABOUT YOURSELF & YOUR READING HABITS: I read mostly science fiction/fantasy (pure escapism), also women's studies/feminist theory and literature, poetry, the occasional best seller. WHAT DO YOU LOOK FOR IN A BOOK: One that will keep my interest, that I can feel empathy with and learn something from. PAGES/PUBLISHER/COPYRIGHT DATE: 338 pages, publisher: XLibris Corporation, Copyright 1999. WHAT IS STORY ABOUT (PLOT): It is the story of a young girl and her family escaping the Nazis in 1930's Germany, immigrating to the United States and her life and times growing up and becoming one of the founders of the National Organization for Women and in the forefront of the Women's Movement. WHAT I FOUND COMPELLING ABOUT IT (CHARACTERS, IDEAS, WRITING STYLE, ETC. ): Through Ms. Pressman Fuentes' anecdotes about her family and their life, one feels like you know them; as if they could be your next-door neighbors. HOW IT MADE ME FEEL: I smiled a lot at the eccentricities of her family, especially about her father and a warmth at the humanness within each family's uniqueness. CAUTIONS (HARD TO GET INTO, DIFFICULT WORDS, HARD DIALOGUE, ETC. ): None (Ms Pressman Fuentes even explains the Yiddish words she uses throughout the book for the non-Jewish reader). 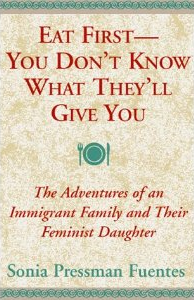 WHAT KIND OF READER MIGHT LIKE THIS BOOK: Anyone who is interested in learning about the immigrant experience, European and assimilated American Jewish culture, but especially women interested in the her story of the new wave of the Women's Movement in the 1970's and learning more about one of the founding mothers. ANYTHING ELSE YOU'D LIKE TO ADD (PURCHASING INFO, FIRST PARAGRAPH, FIRST PAGE, BACK COVER BLURB, WHATEVER ELSE! ): In short, Ms. Fuentes is an extraordinary woman in extraordinary times in this country. Her unique family and perspective shines in this autobiography and the reader feels a kinship with her and her family's struggles, their love and their determination because it speaks to us all of our own.